This manual is about how to use Academic Signature for digitally signing documents, the context in which to use it and some important basics of cryptography. It is not about explaining the menu options. In spring 2013 the Snowden revelations about abusive and persistent privacy intrusion by US and UK governement agencies(aided by the german BND) gave a surprising new importance to the enciphering options in Academic Signature. I didn't anticipate that and had initially regarded enciphering as a free addon to the technically more challenging authentication schemes. It so happened that nowadays my software seems to be primarily used in self-defense for encryption. The logs reveal that most downloads go to North America, many to Germany, France, Russia and untraceable proxies(well done! ), some into remaining Europe, a few to Asia and almost none to South America. Lately computers in some asian countries(e.g. Malaysia, China or India) became active downloaders. This usage is necessary due to the piss-poor job of our politicians in protecting the freedom and privacy of the population they were elected to care for. Consequently in 2013 I began to use Academic Signature additionally for encryption of the communication with partners in industry. If we exchange information about the assessment of work done by our students and the appropriate grading, we cannot allow nation state secret agencies to collect and evaluate sensitive personal data or company secrets to illegaly fill their cabinets with. The remainder of this manual relates to authentication. In my teaching position at a university(University of Applied Sciences Wedel / Fh-Wedel) I am frequently asked by students to write letters of recommendation for job applications, applications for entering curricula at other institutions, applications for scholarships and the like. The project Academic Signature was initialized unwillingly by a large german organization giving out scholarships. They gave me a form(needless to say “paper”-form) to write the letter of recommendation into and I was supposed not to write by hand but to explicitly use a “typewriter” instead (year 2010! Can you believe it? ), sign the form, put it into an envelope and send it to them. This was definitely enough! So I decided to develop “Academic Signature” and finally get us into the 21st century. The primary purpose of Academic Signature is to serve as a drop in replacement for this 19th century process. Please note, that the proposed use of Academic Signature for authentication of academic documents and the respective public keys in the academic community(or other communities) is substantially different from the fully anonymous community use, the standard PKI(Public Key Infrastructure) is intended for. Standard PKI tries to establish a continuous “chain of trust” reaching from a single central authority(the government or the big software vendor that finally wins the race) into the branches to you and me. This structure would be well suited for electronic signatures and communication if set up properly. Another distinct model for trust management is the “web of trust” employed e.g. by PGP, where communities of trusting friends connect to form a web of connections. This setup allows for individuals that don't know each other, but are connected by a thread of trust via shared trusted friends, to communicate confidentially. Digital signatures are of limited use in this web of trust, because to my knowledge no individual information about the partner you are communicating with other than composition of the public key and strength of trust connectivity is transferred. Academic Signature works in a “mosaic of trust” that forms in a semionymous(somewhere between onymous and anonymous) community like e.g. the academic community, the community of soccer team managers and trainers, the Beatles web-fan-page maintainers or the like. It is essentially the mosaic of trust we have been used to rely on paperbasedly in daily life for centuries, long before the advent of the computer. In essence the digital signature created with "Academic Signature" is logically equivalent to the medieval leaden bulla of the pope or nowadays the poor man's physical signature in ink. It has to be accompanied by additional information from other parallel channels. If we get a physically signed letter of recommendation from a colleague, we usually don't even know and recognize the signature itself. We memorize having read a paper from the colleague, maybe we have seen her at a conference, we check for professional paper and letterhead from her affiliation, we read the text and recognize whether it sounds professional or could have been written by a student(->the "semantic test"). And if in doubt we finally make a phone call. This typical state of affair can be substantially improved, if a digital signature is used instead of the ink signature. Transferring the letter can be sped up to seconds, the student does not need to get notarized copies of the letter to supply several applications, forgery of the digital signature is overwhelmingly more difficult. But keep in mind: The other components of the mosaic of trust must remain in place and maybe be amended for the modern techniques. You might have not met the colleague personally but may have skyped her, you perhaps did not visit her lab but inspected her website and considered it professional, you may not inspect the watermark of the letter paper but make sure the colleagues website offering the public key is embedded in the right, serious university web appearance. And if in doubt, you still pick up the phone. Please note, that two of the above mentioned models of trust(web/mosaic) ultimately deal with interactions between people and trust between them. (The chain of trust, exclusively relying on cryptographic protocols without direct human involvement and relying on the integrity of a central authority is best suited for interactions between software/net entities and is the only model of trust that may operate -or go nuts- in the background without user awareness or control). So the mosaic of trust is not primarily a concept of "IT-security" but of security in general everyday life. Thus Academic Signature, relying on the mosaic of trust, is not an entity of "IT-security" but a standalone IT-tool having the potential of serving and enhancing general security in everyday professional communication. Using Academic Signature requires computer literate users with security awareness. The user should know the very basics of public/private cryptosystems(preferably even of elliptic curve cryptosystems) and the user be it signer, messenger or prover must understand, that Academic Signature used with the protocol described below is a faster, more secure and more efficient drop in replacement for the traditional ink signature. Not more and not less. It can be regarded as a second generation intellectual empowerment for authentication. In former times the first generation was also established in a small semionymous community: Those few who could write could sign. Now those who can competently use asymmetric cryptography, can sign digitally. a) The user is cryptographers main security risk and has to be protected from degrading security by inventing reckless shortcuts. Automate anything that can be automated, reduce risky user interaction to a minimum. b) Give as little as possible options, show as little as possible information. c) Never invent anything, stick to approved, certified algorithms. d) The users (and the buyers) of cryptographic software have no interest in the internal logics of en/deciphering or signing. They want to trade money for security and not stress their brains. a) The user will only accept employing digital signatures if he/she is enabled to understand what he/she is doing and only if he/she has manual control over each single step in creating the signature and releasing it to the public (or withholding it at the last second for double checking). The user is as responsible in applying the signature software as he/she is when signing a cell phone contract, a cheque or when shopping with the credit card(hopefully even more so). Academic Signature will not attempt to protect the user against what might be presumed ignorant or risky behavior. I consider this a matter of respect towards the user. d) The user is striving to understand what she/he is doing and why(even on the computer and even on a windows-os) and goes through life with a curious mind. In my opinion everyone should adhere to that principle in any case, anywhere at any time. There are only few alternate domains supplied with the Program. This is to promote transparency for novice users and ease compatibility towards older versions of academic signature. There is, however, a domain dialog for handling use of multiple and distinct domains. The advanced user will be able to go e.g. to a 512 bit domain by researching how to create a new domain(not trivial) and/or import it (see e.g. http://www.ecc-brainpool.org/download/Domain-parameters.pdf where I got some domain parameters from). It is also possible to import and use the NIST-Domains. You have to watch out though - there may be some copyright protection of the NIST-Domains in some countries and you should make sure to use only domains larger than 230 bit. Domains of smaller bitsize may become insecure over the next decade. Lately I created and posted additional ec-domains of substantially larger bitsize than the NIST or ECC-Brainpool domains myself. You get them here. Furthermore, the current version of academic signature supports cross domain operations and you can e.g. sign a document with a key from a 1033 bit domain and encrypt it for a recipient using a public key of say a 640 bit domain with one mouseclick. One type of mathematical function is a core necessity to establish Public Key Cryptography. You need a so called commutative "Trapdoor One-way Function". A one-way function is a function that can be efficiently applied to an argument(i.e. it can quickly be evaluated) but which cannot efficiently be inverted. It would take excessively long to find the argument if you are only given the result. Exponentiation in a prime field(= modulo a large prime) is an example for such a function ( i.e. the mother of all such functions, the inverse function coining the name "Discrete Logarithm"). There are more mathematical functions with these properties and nowadays the hard problem of inverting such a function(i.e. finding x for given a, p, f(a,p,x)) is called the "Generalized Discrete Logarithm Problem" ( or the generalized DL-Problem). Onewayedness and commutativity of the function application are sufficient to perform a so called Diffie-Hellman Key exchange and the so called elGamal encryption. For creating and verifying digital signatures the function additionally needs the "trapdoor property". Knowing a secret, and only knowing this secret, the function can be inverted. The secret here is knowledge of the discrete logarithm x, which renders inverting easily possible(if working within a subgroup of prime order). Asymmetric encrypting is performed with a publicly known key of the recipient. 1.) The plaintext is enciphered using a symmetric algorithm e.g. AES or Dancing Fleas (the one I am using for securing keys in Academic Signature). Finally the recipient decrypts the ciphertext using the recovered key. Digitally signing a file means performing a mathematical operation on a secure hash-value of the file, that can only be done in reasonable time(before the sun goes red giant and swallows earth) if the secret is known to the signer. Everyone who knows the public part of the key can quickly verify, that the file was signed by the holder of the secret i.e. the private part of the key, but cannot sign. The operations necessary for signing and verifying are somewhat more involved for DSA and ECDSA than just inverting the trapdoor one-way function in the above example and involve use of ephemeral keys. (They are extremely simple in the RSA-system though - just encipher the hash with the private RSA key.) The steps can be seen in detail for the ECDSA system here. In brief: You perform a calculation involving a unique and secret ephemeral key and your permanent private key. This calculation involves an equation featuring a product of the inverse of the ephemeral key ke, a publicly known signature component "r", your private key and other non secret terms (including the hash value of the document). As long as it stays being one equation with two unknowns(to the public), it is safe. If an attacker gets knowledge of the ephemeral key(or if the same one is used twice and the attacker suspects that) the equation has one unknown left(on ke reuse two equations with two variables) and is easily resolvable by the attacker to get hold of your private key with catastrophic consequences. Thus good random numbers are of utmost importance for safe ECDSA (or classical DSA) signing. Academic Signature supplies the "Dancing Fleas RNG", which is primed on hatching, re-randomized every now and then during program execution and whose state vector on exiting is stored with cryptographic protection. Please note that in sophisticated attacks on DSA or ECDSA, the random number generator is a prime target (and has been in the famous break of the ****-game console recently). To my knowledge, standard bodies have not endorsed a specific RNG yet and different creations(like e.g. Dancing-Fleas-RNG) are in use today. Professor Smart (S=Signer) is the signer wishing to do all the best for his/her students. The testimonial is about Dr Honest who will honestly forward testimonial and signature along with his/her application to Professor Veryrich (V= Verifier) who admits to a curriculum or hires research or teaching assistants for the sole purpose of advancing academic knowledge and helping Dr Honest to get along with his/her career. Professor Snake may out of jealousy or rejected love try to discredit Dr Honest or Professor Veryrich by giving out faulty signatures, Dr Mallory may try to forge a testimonial to her advantage and Professor Vain may maliciously discredit Dr Honest or Professor Smart out of jealousy or as an attempt to hide his illiteracy in computer matters. These participants will be on stage in the later paragraphs on the security of Academic Signature. 4 The Secret in the Elliptic Curve Cryptosystem(ECC) “Academic Signature”. 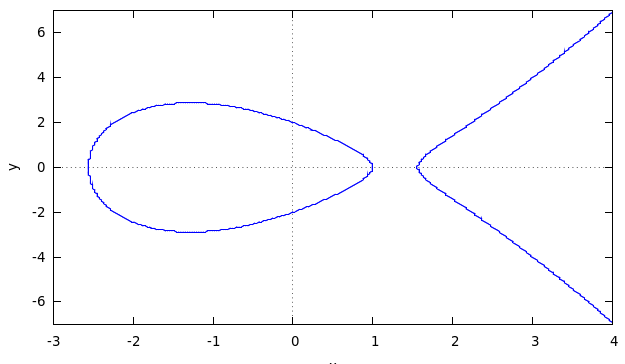 The ECC in general is based on the hard problem of finding the secret factor "x" in the operation "point multiplication" of a publicly known Point "D0" on an elliptic curve, that leads to the published resulting Point "A". The operation "point multiplication" is the Trapdoor one-way function that is commutative and can only be inverted if the secret x is known (and if additionally the point operations are performed modulus a large prime p, leading to large known! prime group order q). This point multiplication is logically equivalent to the exponentiation in the example from paragraph 3. In an ECC "x" is the private key, A is the public key and D0 along with other domain parameters are publicly known and must be agreed on before the cryptographic interactions at hand. 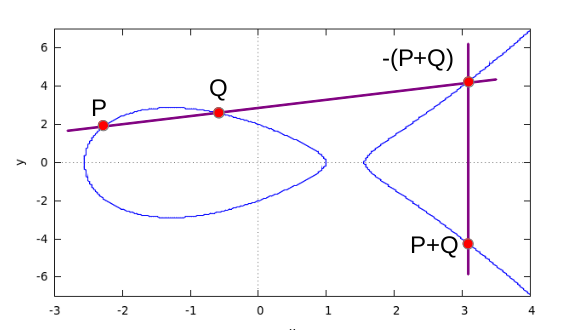 The "sum" of Points P and Q is the intersection of a line through P and Q with the elliptic curve, mirrored at the y-axis. You get the negative of a point on the curve by inverting the y-coordinate. Or, to state it in an alternate way: The point-sum of three intersections of a straight line with the curve is 0. Graphically the definition extends smoothly to the case of P=Q, where the straight line is a tangent to the curve at P and the intersection is P+P=2*P, the doubled point. For mathematical reasons you have to include the point (0, infinity) as neutral element of addition. The calculations performed in real numbers are of no use for cryptography, so they are performed for large integer numbers modulo a large prime p. In this case, the "curve" is transformed into an unpredictable scatter of points in the x-y-plane of integer numbers. Please note that point multiplication with a large number now involves a "large number" of large integer divisions, which are very slow to evaluate. In order to get tolerable execution times, you have to switch to some version of so called "projective coordinates" to replace the divisions by multiplications. As in exponentiation used in the classical DL-problem (e.g. in classical DSA) point multiplication can be performed in the usual way by chaining shifts and additions(add(ECDSA)/multiply(DSA) shifted value if the corresponding bit in the factor(ECDSA) or exponent(DSA) is 1). Domain parameters -the "stage on which calculations are performed"- are the prime module p used in the classical algebraic operations and the curve parameters a and b and a selected primitive point "Do" which generates a group of prime order "q". Academic Signature has a menu entry "elliptic_domain -> domain dialog" allowing the user to inspect the currently used parameters a, b, p, Do (and resulting q) and to perform numerous other operations on domains. For creating a signature(or for decryption), the trapdoor function (here: point multiplication) must be invertible for the holder of the private key. This is not possible for arbitrary combinations of prime moduli p, curve parameters a and b and primitive point Do. One way to achieve invertibility is to choose a combination of p, a and b such that the points using the operation point multiplication/addition mod p based on primitive point Do result in a group of points of large prime group order "q". In this case the inverse of a known integer factor in point multiplication(e.g.the private key) can be found efficiently with the chinese remainder theorem(="Chinesischer Restsatz" in german). To find such domain parameters that result in (large) prime group order q is a difficult task. Determination of the group order alone is calculation intensive already. It is determined with the Schoof-Elkies-Atkins algorithm. Then try until it is a large prime close to p. If you want to create a domain yourself, you may e.g. use the "miracl" tool published by Shamus Software Limited. It is free for non commercial use and can be downloaded from here. Luckily this is about the only really calculation intensive task in ECDSA and we can use domain parameters published by trustworthy noncommercial organizations. NIST , ECC-brainpool or my humble self -> my_domains are sources of such domain parameters . To sum it up: In the case of elliptic curve cryptosystems (ECC) the very hard part is finding an appropriate domain ) - (the problem is non existent for RSA and of medium difficulty for elGamal and DSA) whereas the generation of private/public key pairs is laughably easy for ECC ("babyeierleicht" as my son would call it). (for comparison: It will take your computer some minutes to create a strong RSA key, it is easy for elGamal and classical DSA also). The private key is an arbitrary number slightly smaller than group order q usually denounced "d". Impatient people may precalculate the inverse of d to save a split second later on for signing. Academic Signature calculates this value on the fly only if needed, using the chinese remainder theorem and discards it after usage. Academic Signature will suggest appropriate random numbers or you can type the key yourself into the corresponding field in the key generation dialog to add some personal flavor. Others cannot calculate d from A in reasonable time, this is a hard generalized DL-Problem. A potential communication partner can multiply your public key A with a random number "ke" he/she selected to get "B" B = ke * A (= ke * d * Do) , and keep B secret. Simultaneously the communication partner calculates "C", C = ke * Do and broadcasts it to you. No third party can recover ke or B but you can reconstruct the shared secret B by multiplying C (= ke * Do) with your private key d. If your communication partner selected -say- the x-component of point B to symmetrically encipher a message with, you are able to decipher it since you can reconstruct the key. This procedure is the ECC version of elGamal asymmetric encryption or -if symmetrisized- ECC Diffie-Hellman key agreement. Please note that the trapdoor functionality is not needed for these cryptographic protocols, commutativity in applying the one-way function suffices. Others could multiply your public key A with a random number "ke" they selected to get "B" and tell you B = ke * A, while simultaneously calculating C = ke * Do and keeping it secret. No one can recover ke but you can recover C by multiplying B with the inverse of your private key d and share this secret "C" with whoever sent you B. This again opens the possibility to communicate securely or to encrypt asymmetrically. Obviously in all cases, you'll have to publish the domain parameters along with your public key A(and the exact procedure used for symmetric enciphering or hashing) to allow for non-ambiguous calculations in all these cryptographic procedures. In the following three subchapters, a special protocol for using Academic Signature is presented, which involves the subject of the testimonial. This protocol is of the broadcast type, where the sender/signer disclaims control over who is going to receive the testimonial. I advocate to use this protocol, because it will produce a benefit for all protagonists involved. Academic Signature could be used in a different protocol without the involvement of the testimonials subject, where the content is concealed from the testimonials subject and the prover communicates directly with the signer. I consider this variant marginally unethical and disapprove of using Academic Signature for this variant. A logically sound implementation of this alternate protocol involves public signing and encryption, which is possible with academic signature. But using this type of protocol technically would aggravate the testimonials subjects(=the students) situation. I disapprove of this use and favor openness - please stick to the original protocol! The signer is the person who writes and signs documents (i.e. letters of recommendation, testimonials,...). Naturally the requirements for computer literacy and responsible conduct are higher than for messenger or prover. Signers utmost duty is to protect his/her private key. Everything else is of lower priority. If a key has been compromised, this has to be posted on the signers webpage and the key has to be blacklisted. The signers duty is furthermore to post his/her public key(s) together with contact information preferably on a protected corporate/university website. The website should also show the signers professional position to allow provers to assess the significance of the signature. Signers should keep a file of all documents signed and it is recommended, that a conventionally signed paper version is also handed out to the messenger. Under all circumstances signers must carefully read what they sign. It is strongly advised that signers sign only documents they have personally produced. The signed document should contain a header and/or footer with the information that it was digitally signed, where to get the public key of the signer, correct date, place and name of the signer (as in a conventional signature). The signer is advised to sign in a "ceremonial" quiet atmosphere, preferably office doors closed, certainly in the absence of the messenger. He/she should never ever leave the computer while logged into Academic Signature (-> see the coffee break office ambush). Immediately after finishing work with Academic Signature, the program should be closed. If a private key is phased out, the signer is responsible for physically deleting the private key. The public part should stay visible to the public, if the key has not been compromised, to allow for future verifications. For demonstration purposes I created an example testimonial and the corresponding signature. The prover is the person who has to decide about admitting the applicant to a curriculum, hiring him/her as research assistant etc. The provers obligations are naturally less extensive than the signers. Additionally, the interaction of the messenger with the prover is less intense, than interaction with the signer. Cheating by the messenger is much harder and thus less likely to be attempted on the provers side compared to the signers side. First, the prover reads the presented document carefully and decides if a verification of the document is at all necessary. If the prover doesn't feel sufficiently computer literate and needs to prove, he/she doesn't hesitate to ask for a conventional version or phones, skypes or emails the signer for informal verification. A computer literate verifier downloads and installs Academic Signature(if not already present) according to the procedure given in section 6. The prover gets the public key from the website indicated in the documents footer. The prover carefully and thoroughly assesses the credibility of the website and the pages it is embedded into(or the alternative source) and additionally assesses the significance of the signers judgment regarding the messenger. This is the step of utmost importance on the provers side. It is advisable to locally store the external public key and e.g. retain the key in the protected Academic Signature depot file. The prover uses Academic Signature to verify the signature. In case the verification fails, technical failure or human error, not forgery by the messenger is to be considered the most likely cause. The prover subsequently contacts the signer, informs about the verification failure and inquires about the correctness of the contents of the testimonial. The messenger is the person who transports the document plus signature file from signer to prover and is also the subject, the document is about. In crypto terms he/she is the “insecure channel”. Naturally the messenger has the means(and the right) to skip the protocol altogether and throw the message away. The messenger is the participant with the highest possible gain from fraud and therefore is not involved in signing and verifying. She/he is physically absent during these procedures. There are no obligations for the messenger in this “protocol”, but the messenger has certain rights in the protocol at hand. The messenger receives the document file containing the testimonial and the respective signature file and -if considered favorable- transfers them to the prover. He informs the prover about the presence of a digital signature and hints at the verification procedure. Upon request by the prover, the messenger supplies a classically signed paper document -no questions asked -no rolling eyes. The messenger has the right to keep the document confidential and not show it if he/she considers the content unfavorable. For added security, prepare a cryptographically protected drive (e.g. using Veracrypt) and create an empty directory. Unzip the downloaded archive into this directory. Newer versions of Academic Signature also exist as windows setup files, which automatically install the crypto software and place icons to the appropriate places. During execution of Academic Signature, less sensitive parts of keys(name, id, public components) reside temporarily in a plaintext file and in plain form in memory. Remains of deleted files have protection if the files were residing in a cryptographically protected disk domain. Academic Signature adheres to the hatching duckling model for installation. If called for the first time, it is in a vulnerable state and the sensitive files are protected with the keyword "default". Then to imprint your exclusive access it asks you for a passphrase, to immediately protect your sensitive data with. The passphrase -of course- is not recorded. If you forget it, all key information is permanently lost, which includes your private key(s). In a further step the "Dancing Fleas" Random Number Generator(RNG) of 2011 byte length is initialized from a file. You will be asked for a file, that no one else has access to e.g. a picture of you which you just shot with your webcam or a letter, which you never sent. For added security, you may opt to delete it afterwards. Academic Signature digests this file and uses it for initializing the "Dancing Fleas" RNG. Later you can refurbish the initialization anytime by mixing in an arbitrary phrase (Menu-> File ->Seed ....). Your actions during program execution also influence the development of the random number pool. Thus the "Dancing Fleas" RNG will never reproduce numbers even if seeded with identical initializers. The state of the RNG is stored on hard disk with cryptographic protection. This facilitates higher safety for private key generation at a later stage. In the initial state, the keyfiles include a dummy key(private and public) for playing around with and my public key, which I used to sign the binaries with. Generation of cryptographically strong keys takes a split second. They gain value by your act of using them. As long as they haven't been used and the public part is not published, they can be deleted without second thought. As a first exercise you are advised to check the signature of the program itself. The executable's signature is the file with identical name of the executable with the additional extension ".ecsg" (=Elliptic Curve SiGnature). I signed it with my private key. (My public key is already in store after hatching for warmup exercises). The public key should be taken per copy and paste from my webpage https://www.fh-wedel.de/~an/crypto/academic_signature_key.html after assigning the trustworthyness of this site by checking e.g. the proper embedding in Fh-Wedel's official web-appearance. The key is also present on the website in form of a human readable file, which can be imported into Academic Signature. Basically the public key consists of two coordinates of a point in the plane(Ax, Ay). It is valid in the context of certain "domain parameters", describing a specific elliptic curve. For simplicity I included a standard domain with 256 bit keylength (comparable in security with a 3072 bit RSA-Key - banking applications mostly use RSA-2048 most others 1024, this webpage from Fh-Wedel is protected against hacking with 1024-bit RSA, the self issued certificate shows that the key expired in June 2009, which is no problem if the certificate is self issued anyway ;-). The parameters of this default domain were taken from from ECC-brainpools website (http://www.ecc-brainpool.org/) where you can also find information on ECC security. Depending on your system speed, verification may take some seconds, the main time being used for generating the hash of the executable. (The elliptic curve operations themselves take a split second even for the largest domains of 1024-bit or more.) If you would want to sign a movie of 1 GB, you'd have to wait for some minutes ;-). But remember, changing one bit of the gigabyte somewhere will completely change the hash value, and this has to be achieved in a cryptographically secure way. I do admit that there are faster hashes than the newly introduced algorithms of the "Fleas" family. (If this is a major problem for you you should use the sha options). And if I knew how to speed "Fleas" up safely, I would. But to reduce your annoyance I should mention that faster hashes are inherently more susceptible to “brute force attacks”(http://en.wikipedia.org/wiki/Brute_force_attack). Verifying the Linux binary should take about 1 second, under windows you will need about 2 seconds to verify. The elliptic curve calculation itself takes negligible time even on my little samsung netbook under Linux-Ubuntu(a little slower -as usual- under windows7). My apologies, this is an amateur one man show yet. So you find only binaries for the standard PC (i386 instruction set), for Linux(32bit and 64bit) and Windows (XP and 7) here. Mac users should be able to run the Windows version under Wine. I regret not to be able to support different platforms with binaries at this point. For everyone else I included the source code. You need to have wxWidgets and GTK2.0 installed in order to build Academic Signature. Please use the aca_sig download page( in german / in english) for getting the latest version of academic signature. At the download page you will find the latest versions of Academic Signature, my GnuPG signature of the respective downloads, elliptic curve signature and timestamp (incl. Makefile for Linux environment and code::blocks project file). I publish this code under the GNU public license. If you use Academic Signature and especially if you download and possibly alter the source, I would be happy to hear from you via an@fh-wedel.de. As a second warmup exercise you could convince yourself what happens if a single bit is flipped after signing a document. Sign a large wordprocessor document. Open the newly created *.ecsg file for inspection with an editor of your choice. You will find the domain name, the signature parameters "s" and "r" and an identifier of the hash algorithm used for signature creation(e.g. Fleas_1_8, SHA2, Fleas_lx , ... ). Inspect the signature file and close it unchanged. Verify the signature. Now open the signed document again and flip one bit by changing one capital letter somewhere in the document to lowercase. Close and save the marginally changed document. Convince yourself that the signature is rejected now. This is by no means a proof of the cryptographic security of the signing process but gives you a basic idea of what happens in a blunt, unsophisticated fraud attempt. After the program is properly hatched on your systen (see section 6.2), you can prove the correctness of a signature. Open Academic Signature and log in properly. Select from the Menu "Elliptics->ellip_operations->ellip_Verify". The verification/proving Dialog opens. First you should locate the signed document on your computer and select it via the button "select File to prove". The signature file is supposed to be located in the same directory, having the same filename as the document plus the extension ".ecsg". Academic Signature suggests this signature filename automatically in the editable line below the file name field. In case someone used a different filename for the signature to add some personal flavour (don't! ), you can edit the filename/path of the signature file to coerce it into something different. Then select the public key that belongs to the person who signed the document. Convince yourself that you can trust the source of the key and that it indeed belongs to the person you presume and that this person is indeed in the position to sign such document. Attention, this is indeed the most critical part and achilles heel of ALL public key Cryptosystems!!!! The very act of retrieving the public key from a trusted source independent of document and signature file is an absolute core responsibility of the prover. ....... Do you let salespeople pick the money for your purchase from your wallet themselves for your convenience.....and meanwhile look somewhere else....??? a) Copy and paste Ax and Ay and the name of the domain from some electronic document you trust. You may select and type a key id and the signers name in the corresponding fields. This is useful in case you store the key for repeated use. Key id is for the program as a unique reference, Name of the holder is for your personal reference(and can have twins with equal signer name). Hit the blue "Prove ECCS signature" key and wait for the program to proceed. There are human readable public key files in a format understandable for Academic Signature. It uses the extension "*.pell" for Public ELLiptic key and I suggest you do the same. In the dialog for creating private keys there is a button named "Export Public Part". Guess what it does... you'll find a new *.pell file in your working directory. To use such a file in signature verification, just hit the button "Import Pubkey from file", select the file and use it. Of course you made sure you got it from a trusted source. I recommend to store the public key tamperproof for future reference in the protected internal store of Academic Signature. c) Retrieve a securely stored public key from Academic Signature. The button name is "Get Stored Pubkey". Select the one you want the usual way (doubleclick or hit ok). That's it. A file of 1 MB (more than enough for a letter of reference...) size should roughly need 1 second for producing the unique hash-value. The time scales linearly with filesize. The elliptic curve calculations themselves take about twice the time as for signing and need less than the blink of an eye for 256-bit domains on a new PC. The result is displayed in the corresponding dialog field. The presenter has to transport the document(testimonial, letter of recommendation, etc..) and the corresponding *.ecsg signature file to the person who might be interested (if considered favourable by the presenter) and hint to the presence of the digital signature. Usually this will be simply done by e-mail. He/she does not even need to touch the software "Academic Signature". a) Close your office doors and see that you are alone. b) Create or reevaluate the document to be signed. Add/check for correct place and date and the reference to your public key publishing site. Put document into a special folder on your computer that you find appropriate. c) If others have been involved in the process of document creation, make some invisible change(e.g. add a blank at the end of a paragraph). This serves to harden against "Birthday Attacks" towards the Hash. d) Start Academic Signature and log in. Subsequently select "Elliptics->ellip_operations->ellip_Sign": The sign-dialog opens. e) Click on the button "Select File" and select the file. f) The presently displayed key may be a dummy key, so select the proper private key you intend to use from safe storage by clicking on the Button "Select other Key". After some consistency checks and a selftest(about 2 seconds on my netbook), the selected key id and name is displayed in the dialog fields. g) Click on the button "Create Signature". Academic Signature will put a *.ecsg file with the document name as prefix into the same directory as the document. Hashing will take about 5-10 seconds per Megabyte of document length. The ECC operation takes about a second. i) Give document and signature file to the messenger (e.g. via encrypted mail or memory stick) and be prepared to produce a conventional, conventionally signed paper version as well. In Academic Signature select the menu entry "Elliptics -> ellip_keys -> Create/Load/Save_priv". The private-key management dialog opens containing a dummy entry first. a) Type the Key_ID you want the program to use as unique reference(this one and all the following test lines are to be filled without blanks each as a single connected string). b) Type your full name into the field "Full Name"
As it is just a plain old random number with no special properties, you might type in any hex-number of sufficient length yourself. If it happens to be too long, don't worry, Academic Signature will moduloreduce it(modulus domain group order "q") to the right length. Modreduction and recalculation of the corresponding public key (Ax and Ay) will be triggered by hitting "Refresh_A". If you don't fully trust my "weirdo-fleas" random generator(you have to trust it for the generation of the ephemeral keys though) or just want to add some personal flavor, you may change a hex-digit here and there. Maybe you don't like nines - so exchange a couple of them against f or a,.... this number is all yours. If you happen to load my "my_trivial" stored key for inspection you'll see that Academic Signature won't keep you from selecting a stupidly insecure short key. If you like such a key -so be it... (don't use such a key for serious matter though!). Your private/public key pair is bound to the domain, it is by no means tied to this piece of software and can be used on any future ECC-Implementation using the same domain. Mathematics -after all- is the same in this Universe and others... The public part will not change. The domain p256r1 used in Academic Signature is one of a little more than 10 suggested domains on the ECC-Brainpool website and is posted there for about ten years by now. e) If you want to post the corresponding public key(Ax, Ay), you may opt to export the public part - click on "Export Public Part" and Academic Signature will create a corresponding *.pell file in your working directory. In order to allow verification of your digital signatures, the prover must gain trustworthy access to your public key. The method of choice in the model of a mosaic of trust is to post it on your university/corporate-website. The information must be embedded in a trustworthy corporate or university web-environment. Only then can a prover assess of the trustworthyness of the public key information and your competence for signing such documents. You can find my key publication site here. If you use the private key for -say- signing less than 100 documents per year, the lifetime of the key can be decades and is only limited by technical progress in computer power. Certificates(which are basically just public private key pairs) handed out by trust centers which are part of a PKI usually have a limited lifetime. Please inspect some certificates deposited in your internet browser (e.g. edit-> preferences-> advanced-> encryption-> View Certificates in Firefox). Interestingly I found only certificates using RSA, mostly 2048 bit keys. They usually expire within some years, in some cases in decades. 2048 bit RSA-Keys are substantially weaker than the 256 bit ECC Key used by Academic signature. So if they claim to be valid(under heavy daily usage) till say 2035, you can sit back, relax and use your ECC-Key safely till I'll be a hundred years old. Of course, if compromised, the key has to be retracted immediately. The present implementation is not adapted for institutional use for say electronically signing all students graduation documents of a university. On the other hand this would be a goal worth striving for. Students would no longer need notarized copies of their graduation documents for job applications. This kind of use would need hightened security precautions and, to some (purposely) limited extent, added usability tools. a) A dedicated notebook for just this purpose of signing should be prepared and stored in a safe and tamperproof place(e.g. a safe). b) A website protected with high security level should be used as public key presenter. c) The person who is physically signing the fancy paper based documents needs to create a personalized electronic signing key bound to that person, keep it secret and guard that key properly and professionally. This person and his/her assistants, who are usually not acquainted with cryptography, should get a high quality briefing on the do's and dont's of electronic signatures and the usage of Academic Signature. e) The act of signing should explicitly not be automated and remain a manual act of conciously signing the personalized document by willfully clicking on a button, while name of the graduate and grades are visible to the signer next to the "sign"-button. The signed testimonial should be manually given to the graduate e.g. stored on a memory stick along with the fancy paper document. The extra effort on the side of program developer(?s) would certainly not be possible without adequate reimbursement and would require an adequate time for developing and implementing the additional features. Why should the signer go through the effort of understanding, installing and using Academic Signature? The advantage is that it serves the graduates. Doing them a favour, making it easier for them to apply for jobs or school admissions is a high value in itself. Additionally digital signatures will be used frequently in the future. So why not getting acquainted with the procedure now. It is nice to already be experienced when we will begin using them for everyday purchases, hotel reservations flight bookings or other matters of daily life. Authenticated letters of recommendation can be distributed by e-mail in a matter of minutes. No need to pay some authority to certify that (paper) copies are authentic. Messengers need not care about the number of copies any more, they can be infinitely aggrandized in number. There is no second thought on the prover side about authenticity because they are infinitely more difficult to forge than a classical ink signature. Additionally again the "first mover advanteage" in using digital signatures in daily life applies. The biggest advanteage is on the prover side. If considered necessary, the prover can test the authenticity with great confidence in the outcome in a matter of seconds. Even if he/she is not very well acquainted with the signer. Try to seriously assess the authenticity of an old fashioned ink-signature on a document signed by a person you barely know..... it's impossible, at least extremely cumbersome. This is a minor incentive. As mentioned above rejection of modern means of authentication, jealousy or the attempt to cover computer illiteracy could be a driving force for e.g. falsely claiming rejection of correct signatures. The signer can ameliorate a potential incentive if he/she consequently also hands out classical paper based versions. It might be in the messengers best interest not to get a job with this potential employer of questionable credibility(Professor Vain) anyway. This paragraph deals with the strongest incentive for defecting and fraud attempts. It is obviously of high value to a weak or morally inappropriate applicant to obtain false testimonial. Attacks from this side will happen. These could include creating fake signer identities altogether, creating a fake website presenting a key which the messenger created hinself or presenting a document that was signed before the messenger was caught doing something morally inappropriate. The incentive for attack is very high but the power of an attack would be limited though. The resources of a single individual especially in the presence of intellectual weaknesses are to be taken seriously but are not too fearsome. The most likely attack under these circumstances appears to be the empty office ambush to get hold of the private key, if the signer does not apply due diligence in the use of Academic Signature. Another attack might involve the use of a compromised key where the holder of the key did not properly react to or did not get knowledge of the public exposure of the key. If Academic Signature gets widespread acceptance, the availability of such compromised keys on the web must be expected. The long term neglecting behaviour of a previous signer should be considered immoral. Future behaviour of provers should include checking for blacklisted keys and seeking contact with the holders of suspicious keys. This incentive is related to incentive 9.1. The messenger may ameliorate the incentives by consistently falling back to classical paperbased documents if he/she picks up the slightest hints about a possible computer illiteracy of the verifier. Again, it might be in the messengers best interest not to get a job with this potential employer of questionable credibility anyway. Again the incentive is minor. Nevertheless out of emotional reasons a signer might feel inclined to discredit the messenger by giving out false unverifiable signatures. The best protection for the messenger ist an independent check of the correctness of the signature on his/her side. If the signer gets to know disqualifying facts about the messenger after the testimonial was signed, this should not have any influence on documents containing prior judgements. Nevertheless, a signer might condemnably try to repudiate the signature by deleting or changing the published key especially if there have been very few signatures created with this key. There is no real protection for the messenger against this behaviour. If the messenger suspects such repudiation, he/she should consistently fall back to using the classical paper version. This is the most likely mode of attack for Dr. Mallory trying to improve her chances to get a desired position, she would not get otherwise. This is a blunt and fairly unsophisticated attack. Dr Mallory has limited intellectual capbilities and/or was cought employing fishy moral standards. Still she is able to copy Professor Smarts website, modify it(e.g. change the posted public key against a new creation owned by Dr Mallory) and post it at another location in the www. This is fairly easy to do even with limited computer literacy. Then Dr Mallory could write her own testimonial, sign it with her newly created private key and send testimonial and signature to Professor Veryrich along with the false claim that it was signed by Professor Smart and the hint to verify the signature at the fake website. In order to prevent such attack, Professor Veryrich has to make sure the key presenting website is embedded in a professional corporate or university website, which is his main duty anyways. This will easily expose such fraud attempt. A rather sophisticated variant involves hacking the presenting website and only exchanging the presented key against a fake key. This leaves the website embedding intact and is hard to detect by Professor Smart(who may not know his public key by heart) and impossible to detect by Professor Veryrich. This exchange may go unnoticed up to the next verification attempt using a true signature, which will subsequently fail and expose the attack. In an even more sophisticated version Dr Mallory will try to guess the time interval of Professor Veryrich's proof of the signature (which is hard!) and return the public key to the correct version after proving presumably took place. Under these circumstances the fraud may even go unnoticed. The timing of this attack is critical and risky and it requires high expertise. Hopefully some Dr Mallory featuring the talents neccesary for successfully applying this variant may not need a fake testimonial and may get a well payed job with a data-security company or a national secret service anyways. A) Strongly protect the key-presenting website. A) creation of dysfunctional signatures that can't be proven. ->This would be a minor problem and will be easily detected. B) Leaking your login-key to Dr. Mallory. This requires a medium level of sophsitication. Knowing your login key might enable Dr. Mallory to sneak into your office, start your computer, start Academic Signature and read out your private key and use it for creating signatures with undetectable fakeness. As you see, there are several additional barriers to breach. Your office must be unlocked and unattended, Dr Mallory must have the capability to log into your computer and -if this barrier is also in place- must also be able to mount your independently protected veracrypt drive. This is very difficult if you are applying due diligence in using academic signature. However it may go undetected and leave a lot of time to break the additional barriers that remain after the login key has been compromised. If Professor Smart is suspicious, he may verify my signature for the program. Catching and redirecting this task would required a sustantially heightened level of sophistication(and knowledge of the original C++-code) on the attackers side. C) At the highest level of sophistication, thorough knowlege of the program code could allow Dr Mallory to introduce a spy-addition to the program that detects the brief moment in time during signing, when the privat key is present in plaintext. The spy addition could then directly transmit key information to Dr. Mallory. Again the presence of an altered program would be detectable by proving my signature of the program. A Dr. Mallory of that level of sophistication could, however, be capable of catching and redirecting this verification request also. A super paranoiac Professor Suspicious-Smart could still have the means to detect the alteration if he secretly signs the copy of Academic Signature with his first key shorly after hatching. He then hides this signature at some remote place on the countryside of his harddisk and check for the correctness of this signature every time on starting Academic Signature. But let's not get carried away here again. Professor Smart's opponent -after all- is neither Microsoft or the KGB nor the NSA but a mediocre graduate trying to fake a letter of reference. I consider attacks of this type unlikely - they are very difficult. A) If you use windows, at least protect it by a login keyword. B) If you are a little paranoid, frequently check the validity of my signature of the program. C) If you are a full blown paranoiac, quickly sign the program after hatching with a dedicated key, hide and encrypt this signature and regularly test the validity of this secret signature. D) Non-paranoiacs may just sit back and relax - I consider this type of attack unlikely. This attack is related to 10.1 "substituting key presenter webpage" and may develop into 10.2. Dr Mallory, upon presenting her digitally signed letter of reference, hints to a forged website for downloading a compromised version of academic signature to the prover. If Professor Veryrich has little computer literacy, Dr Mallory can have reasonable chances of success. The attack is much harder to mount than 10.1 since Dr Mallory has to produce a trustworthy looking faulty variant of academic signature. The damage can be much higher though, since Professor Veryrich may continue to use this compromised version and may even begin to sign documents himself with this "trojan" program. Luckily he probably is educated enough to know about the risks of downloading software from the net and running it. So we can expect that Professor Veryrich takes due care to assess the trustworthiness of the download site with established "reflexes" and is naturally more suspicious in this step than in acquiring Prof Smarts key. I consider this type of attack as far less likely than 10.1 (Hijacking the key-presenter page) but more likely than 10.2 (manipulating signer software directly). After downloading Academic Signature from a webpage of thoroughly asessed trustworthyness a cautious will-be-prover should first verify the integrity of Academic Signature using my key not from the accompanying key repository but using my public key taken directly from my key-presenter webpage. The naive Signer, Professor Simplemind may be logged into Academic Signature and be about to sign a testimonial. Dr Mallory, an attractive woman in a miniskirt and highheels offers a nice fresh cup of cappucino and has an urgent question about some favorite topic of Professor Simplemind's research. Professor Simplemind -like being hypnotized- leaves his computer and his office to the coffee room to discuss his favourite topic with Miss Mallory immediately. In the meantime Oscar, DrMallory's wannabe lover sneaks into the office, gets into the "load private key" dialog, takes a snapshot of Professor Simpleminds private key, restores the initial windows, leaves the office with his prey and is happily expecting acknowledgements of Dr Mallory's gratitude. This of course results in a catastrophic security breach and severely damages Professor Simpleminds reputation if Dr Mallory is eventually caught later on using fake recommendations from Professor Simplemind. Come to think of it - a chimpanzee lady in red miniskirt with highheels, shaved legs..in the coffe kitchen...... This might attract enough attention to seduce Professor Simplemind to drop his shields and leave Academic Signature unattended. Again - let's not get carried away here, this is a serious manual and I should stop molesting you with my sick sense of humor. To my knowledge the KGB doesn't hire chimpanzee-secret-agents anyways. The signer must avoid leaving Academic Signature in a logged in state unattended and rank this as comparable to leaving his wallet open and unattended on a bench at a trainstation. If your computer is infected with dedicated spy malware which runs in parallel with academic signature, there is no security and no secrecy - Professor Smart has no chance and is lost. This is the main reason for using key bearing smart cards and separate card readers for electronically signing e.g. with the new german id-card. D) Never install software from an untrusted source (except "Academic Signature"....... I know, I know ...... read this manual and decide if you can trust me... this is officially called a "semantic test" and should also be element of the mosaic of trust as recommended in chapter 1 for acceptance of e-signed testimonials). Dr Mallory may wait for Professor Smarts department to have chrismas celebration at some remote restaurant. While he and his colleagues are having fun eating roasted suckling pig, Dr Mallory may get into Professor Smarts office with a duplicate (old fashioned metal)key, steal the computer or exchange the harddisk with a new one containing a copy of the original contents. In case of a hidden disk exchange, she may even lock Professor Smarts door again to keep the intrusion secret. She then brings her prey into the fleabag-filthy hacker appartment of Oscar to get the disk analyzed. In case Professor Smart did not use a separately encrypted domain for Academic Signature and the "/secrets" folder, Oscar will find fragments of or even a full version of your secret key in the "deleted" parts of your harddisk. Dr Mallory can then write her own testimonials and sign them with Professor Smarts key unnoticed - a catastrophic security breach. This attack is efficient and does not need high sophistication on the attackers side, it is thus likely. From version 14 on, this threat is counteracted by introducing a second layer of encryption for private keys, that will only be lifted in memory for a brief moment. Private keys are never ever present in plain on harddisk any more. A relocation of memory to the swap exactly in the brief moment of key exposure is always possible but unlikely. Thus using academic signature version 14 or higher on a non encrypted drive may now be tolerable. B) Dr Mallory may send Oscar, the six foot tall former "nose guard" of the local football team to "convince" you that Dr Mallory deserves good testimonial. She may threaten to send you the ears of your abducted pet or make a barbecue with your kids guinee pigs - use your fantasy - this is called "rubberhose cryptoanalysis". It is cheap, easy and effective. Nowadays kids seem to learn this in elementary school already. C) Special options arise for Dr.Mallory in a country under a dictatorship. She may be close to THE PARTY and threaten to grass on you and tell them you listen to the wrong radio stations with all "due" consequences. Please note that this was a real threat even in part of my country only about little more than twenty years ago! A PKI(Public Key Infrastructure) and use of asymmetric encryption is useless if you are a citizen of -say- iran, china, syria,..... (or a "citizen" of guantanamo for that matter). Under a totalitarian regime you'd need steganography and the like - but that is stuff for secret agents, spies and revolutionaries, certainly not my prime field of interest. For a public key infrastructure to work, you need a political system that respects basic human rights and individual freedom. Additionally you need an IT-infrastrucutre that is not dependent on a monopolist software vendor(now who may that one be?) and not on a monopolist search engine supplier (and who the hell may this one be??). If that is not the case, there is no security and there is no privacy. If I introduced errors in the implementation of ECDSA, Dr Mallory may exploit them. There is a well encapsuled long number arithmetics module which I spent a lot of time testing and optimizing. It served well in former applications of RSA and elGamal and now I use it for elliptic curve calculations. I wrote it entirely myself and know there are e.g. no "rare long carry chain errors" (they can easily be detected working with smaller numbers) and no "machine-specific" optimisations. (You learn nice facts seemingly unknown to some cryptography authors if you delve into this - I learned e.g. that long number division and modreduction is surprisingly fastest if doing it bitwise even in high level language and not employ the 4 byte "div" command of the processor ;-). There is -of couse- a module containing the elliptic curve operations (point addition, point doubling, point multiplication). However, these are fairly transparent and not very complicated. Some limited complexity is added, if you introduce projective coordinates. Still this is all rather transparent and -to my deep belief- error free in Academic Signature. (The core routines were coded within one afternoon and did work correctly on first compilation, a projective coordinate version of point multiplication(about tenfold speed!) was extensively tested against the plain version.) So again, I would not try to attack this implementation, I believe the implementation is correct. Mathematics after all is a much more orderly, regular and transparent topic to be coded than the dirty day-to-day business e.g. creating GUIs using error prone tools. Relax! I am quite confident about this aspect. Forget it. For more than a decade bright people have tried to find a way and did not find it. Each slight partial success has been countered by improvements in domain parameter selection. The Elliptic Curve Cryptosystem is considered to be the most "futureproof", safest and most advanced asymmetric cryptosystem. Don't worry about this one unless the "quantum computer" is fully operational and we all think in q-bits. Academic Signature uses my newly created hash algorithms of the "fleas" family. They adhere to the "Merkle-Damgard Construction". I use them with up to 2048 bit length(They are freely scalable but more efficient with powers of two bytelength (-> 128 byte). They are slow compared to e.g. sha2 which you may use alternatively(for chicken ;-). I favoured (my gut feeling of) security over speed of execution. A) The long bitlength gives good protection against brute force attacks. B) It yields good random properties of the hash value(and the intermediates!) - checked with the "Chi^2 goodness of fit test". C) The "extension problem" is solved by applying the primitive "Fleas-block-randomization" three times with the last block(twice on intermediate blocks). Please attack the hash (the code is available in the archive aca_sig_bxx_sout here) and tell me about the results. I myself am confident and prefer it over sha2. A weak RNG is a prime target for attack. I believe the "Fleas RNG" is strong and no promising target. Again I prefered (my gut feeling of) safety over execution time. Version 10 features an improvement of (my gut feeling of) RNG security over version 9 by using two different versions of state-vector propagating one-way-functions. I combined them to create a fully protected internal state propagated by (presumed)one-way function "a" and a random byte pool derived from the current internal state by (presumed)one-way function "b". The derivation of the byte pool from the internal state via "b" triggering a propagation of internal state vector via "a" for the next round. A) The RNG state vector is initialized with an "ephemeral" file, e.g. a picture just shot with your webcam, that should be deleted afterwards. So the initialisation is seamed. B) It relies on the "Fleas" randomizing function partially described in 10.11. C) The length of its internal state is a formidable 2011 byte(this year! of course it is scalable). D) During program execution, the secret internal state vector is occasionally re-randomized with the current timer readout as external input. E) Each third byte is read out and used as random number, two thirds of the state remain secret in version 9. From version 10 on, the internal state vector is fully protected by generating the random pool via a (presumed) one-way function from the independently propagated secret internal state vector. If the 2011-byte random pool is used up, the secret internal state vector is propagated and a new pool is derived via a one-way function again. Statistically after 2(state-vector bitlength/2) propagations of a perfect PRNG a reentrant number is to be found. This causes a severe entropy collapse in subsequent output - so after at most 1/10 of this usage-number(never reaches this age in practice), the secret internal state is re-randomized with an external input. (The routine is internally called "sexwith(state long integer, external long integer)" in analogy with sexual mixing of the gene pool in diploid life and resets the RNG-age parameter). F) The internal state is stored with cryptographic protection to be deciphered, re-randomized and reused during the next session of Academic Signature. Hey, go and attack it and then communicate with me about the result. Yes, it may be attacked. This could be successful. But chances are the "Fleas-RNG" is safer than what you have been using before. To my knowledge, there is no officially recommended standard for chicken users yet(There are suggestions around how to test RNGs though which -frankly- mostly seem very simple). Thus you are stuck with it. I wouldn't worry too much about this. A Version of section 11 is available in pdf-Format here. It is digitally signed by the author. Find signature file here. Note: On Feb 6, 2012 I published the source code and changed the license explicitly to the GNU public license. As stated earlier, the project academic signature is my personal one man show (yet) and my time resources are limited. Most work had been done in my spare time and in this summer vacation. Thus I do not want to waste time on dealing with legal matters. Dealing with legal matters at all (even in the case of public licenses) cannot be taken lightly, so I avoid it altogether and shall just describe my intentions in plain lay language to the public. My main interest lies in creating a high quality, secure software solution, usable according to the protocol described in previous sections, embedded in a comprehensive security framework based on a thorough threat analysis, part of which has also been presented in previous chapters. Since each single one of all the marvelous tools(Linux, wxWidgets, wxSmith, code::blocks,....) used to produce "Academic Signature" is open source, public license, and all the theoretical background was given to me from the free and open academic community, I feel obliged to make "Academic Signature" available for everyone, everywhere at no cost. Since I am the author of each and every line of soucecode (except a small subroutine for sha2), I consider the sourcecode of "Academic Signature" being my intellectual property. In contrast with most software vendors, however, I draw a clear line between this intellectual property and ownership of the binary you downloaded from my website. I consider the binary as entirely yours, it is your property, do with it what you want. I consider it mandatory that security relevant software and all its data -of course- has only one master: You, the user which it was imprinted on during hatching of the binary. I clearly and purposely abandon control over your copy and/or installation of "Academic Signature". "Academic Signature" assumes a heightened level of computer literacy among its users and it furthermore gives itself the luxury to suppose that you read the manual before using it. Still, I am human, you are human and "Academic Signature" is a program. So it may contain bugs, logical inconsistencies, misleading labels on buttons, may become victim of a trojan or virus attack or may be used inappropriately by you. In all these cases I will not bear any responsibility for resulting financial damage. You use the program at your own risk. I would morally feel responsible to some degree though and promise to continuously fix bugs brought to my attention. I furthermore promise to continuously fortify possible targets for attacks in upcoming updates.